EQUIX Health's Home on the World Wide Web ... Welcome! 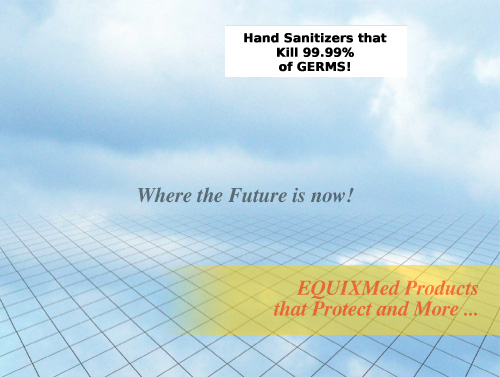 EQUIX Health is dedicated to serving the needs of hospitals, medical centers, oral surgeons, dentists, wound care specialists, nursing homes, health institutions, practicing health care professionals and emergency/first responders. High Quality First Aid and Personal Care "On-the-GO" Products for Consumers! BloodSTOP® to help those with bleeding issues from nosebleeds, cut scrapes and skin tears. And , BEE'S BEST Products that include our SENSATIONAL Beeswax 100 Natural+SPF15 Lip Balm that protects your lips from the sun and also Travel-Size Hand Sanitizers you can take anywhere that KILL MRSA, C.diff and E.coli! Our commitment is to continually bring the highest quality most cost-effective products and supplies to the marketplace that help improve the quality of medical and personal care! NOTE: As of 1/1/2011 we no longer carry the OTC Consumer Product. Aerosol Room Fresheners & Paper Towel Dispensers! High Quality and High Impact Plastic Dispensers! Available in Off White & Smoke! EQUIX Health Quality means more dispenses between maintenance cycles and Tough Durability! All names and marks are the property of their respective companies.